Red Sox Nation, its citizens clad in team jerseys and caps, business suits and ties, descended on City Hall Plaza yesterday, to celebrate winning the division crown and continuing the yarn that is the storied rivalry with the Yankees. Moments into the pep rally and party, pockets of fans broke into anti-Yankee chants, making it clear that watching the Sox hold off a late-season surge by their American League East arch-rival had sweetened the team's first division title in 12 years. "It was pretty awesome," said Barbara Zemba, 70, of Billerica, who said she has rooted on the Red Sox since she was a girl. "It would have been nicer to win it a little faster than we did. But that's OK. We did it, and the Yankees lost, and that's what counts." Boston was one of eight cities across the country yesterday hosting Major League Baseball-sponsored rallies of their teams' playoff-earning seasons, but don't tell that to Mayor Thomas M. Menino. "We have the best fans in America, the best ownership in America, the best team in America," Menino said in front of a crowded, though not packed, plaza. "We have it all right here in Boston." Thousands attended the celebration, but officials did not release a crowd estimate. Among the team representatives who spoke to the crowd, manager Terry Francona and rookie pitcher Clay Buchholz, who pitched a no-hitter in his second major-league start on Sept. 1 and won't be on the mound for the playoffs, garnered the loudest ovations. Players Javier Lopez, Kyle Snyder, Mike Timlin, Jonathan Papelbon, and Jacoby Ellsbury also addressed the crowd, thanking them for their rabid support. 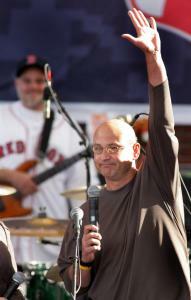 Francona highlighted the hundreds of fans who hung around Fenway Park for hours following the Red Sox victory, to wait out the Yankees' 10-inning defeat in Baltimore. The loss clinched Boston's division title, and the fans joined in the players' celebration. "The most special thing for me was the other night sitting back in the clubhouse with a cigar and a bottle of champagne," Francona said, pausing to let the crowd cheer. "And then watching it spill out onto the field where you loyal fans remained. Jonathan Papelbon dancing across the infield. Things like that make this city the best baseball city in the world." Papelbon's extended celebratory jig, projected onto the plaza's huge television screen yesterday, was a source of delight for the assembled faithful. He promised more of the same. "If we win the World Series, I'll dance all night long," he said. "I thought it was pretty good," critiqued Aaron Souza, 8, Jr., who watched the celebration Friday and attended the rally yesterday with his father. "He dragged me out here," said Aaron Souza, Sr., 30, of East Boston. The Red Sox hope to keep their surge alive in the playoffs, which are scheduled to start in Boston tomorrow against the Angels. Yesterday's rally included music by bands that have become part of the Red Sox soundtrack. The Dropkick Murphys played songs from their new album, "The Meanest of Times," and the Standells sang "Dirty Water," which is played after every Red Sox victory at Fenway Park. The rally also included a tribute to the 1967 Red Sox on the 40th anniversary of their win over Minnesota to capture the American League pennant. With the exception of New York City, where no rally was scheduled for the Yankees and the team's wildcard berth, the home city of each playoff team hosted a celebration. That includes San Diego and Denver who played a tiebreaker last night for the final wildcard playoff spot. Denver won in extra innings. Red Sox fans are "pretty passionate," said Evan Cipriano, 18, a student at Northeastern University. "People always [ask] whether Boston's a Patriots city or a Red Sox city, but I think you got to give it to the Red Sox."